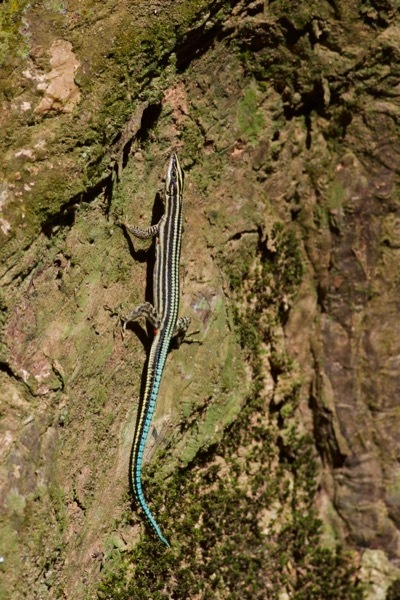 These tiny, graceful lizards are so lightweight that they can, to a certain extent, glide "like a feather" through the air. They use this ability to extend their range when leaping from branch to branch in the forests of Africa. I knew these lizards were present in Ghana and really hoped to see them, but I had no idea whether we would be visiting the right kind of habitat. 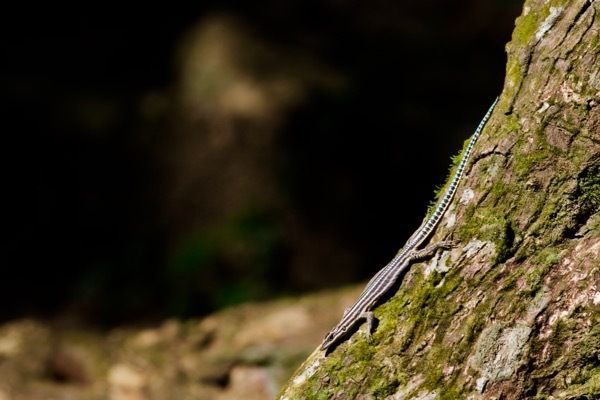 But sure enough, within an hour or so of arriving at our first forest stop, I caught a glimpse of movement near the base of a large tree just across the road from our lodging, which turned out to be one of these little Lacertids basking in the mid-afternoon sun. At least a couple more were on the same trunk. If I got anywhere near the tree, they would all quickly duck into cracks or under fragments of loose bark. I got a few photos from quite a distance with a 300mm lens and tripod. I looked for them again several times over the next couple of days, but they did not reappear for more than a few seconds. I think I was lucky to be looking when the conditions were just right on that first day.